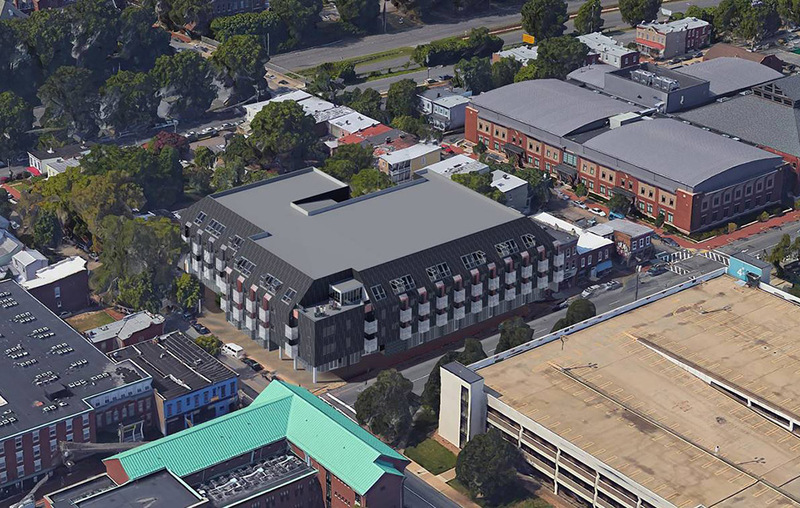 J. Elias O'Neal wrote: A collection of mostly derelict properties along West Cary Street at the edge of VCU territory is slated to meet the wrecking ball as an $18.5 million mixed-use development is in the works to take its place. A group made up of Kevin O’Leary and James Flanigan, who own J.D. Lewis Construction Management, and local developer Larry Cluff are assembling 13 parcels near the corner of West Cary and South Laurel streets where they’ll build a four-story, 100-unit apartment project. The group began quietly assembling the parcels last year, O’Leary said. Through their 805 W Group LLC, they purchased 801, 803, 805 and 807 W. Cary St.; 104, 106, 108 and 110 S. Laurel St.; and 812 and 814 Green Alley in late 2017 for a combined $1.9 million, according to city property records. Combined, the 10 parcels were assessed for about $1.7 million. They also have a deal in the works to acquire 809, 811 and 815 W. Cary St., O’Leary said. The 13 parcels encompass about 1 acre for the future project. They include four vacant buildings fronting West Cary Street, along with surface parking lots along South Laurel Street and Green Alley. Dubbed 805W, the project would include 10,000 square feet of retail on the ground level with parking for residents and future commercial users. The remaining three stories would include a mix of one- and two-bedroom apartments, O’Leary said. J.D. Lewis Construction will handle construction. Architecture Design Office is designing the project. As of December 2, 2018: Topped out. Don’t like the slanted roof and the reason for doing it didn’t make sense to me since this is an urban environment. Not sure what to think of this building yet. I really liked the buildings that were here previously, so this new development should be an enhancement to the site. The slanted roof is a modern take for sure. However, I'm worried that the façade materials are going to look out of place due to the dark colors shown in the rendering. Hopefully the finishes on this building will enhance its shape. It can't be any worse than the newer/renovated apartment buildings located one block east.